Friday September 28th 1883 Mother and Lee went ot the valley to spend the day and Aunty Walker came over to stay with me. I had some time to sew and finished Mays skirt and done some other work. It was late before the folks got home in the evening and it kept the supper around till bed time. Saturday September 29th 1883 Some of the boys went to Cedar Rapids to spend the day so our family was not very large I did considerable sewing. Mary Tuck spent the afternoon with me. I went to town with her after supper and Hatt and I went girl hunting with poor success. 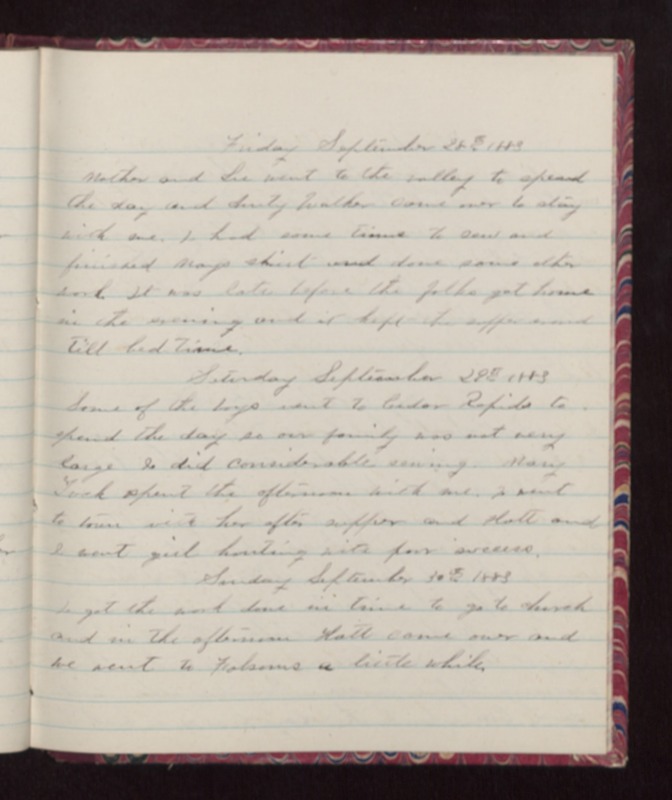 Sunday September 30th 1883 I got the work done in time to go to church and in the afternoon Hatt came over and we went to Folsoms a little while.